Approaching the beehive slowly, Emanuele Agosta makes every movement seem like a part of the bee “waggle” dance. Part of his choreography is lighting a stick of incense. It is the same, he says, as making a phone call. “What do you do when you want to go see a friend? You call him first, to make sure you’re not interrupting him.” Emanuele does the same. He announces his arrival to the bees with the lulling burn of incense, and they prepare to welcome him as he points out the queen bee to us. “How can you recognize her?” we ask. “She’s very vain,” he replies, smiling. “she gave herself a coat of polish.” We look closer. The queen bee has a brilliant, emerald streak across her small body. It is a brush stroke of identification that Emanuele has given the queen in order to immediately recognize her among the other bees. Emanuele’s beehives are on the hills that slope towards the sea between Modica and Pozzallo, Sicily. The countryside is broken by stone walls and carob trees. It is not a coincidence that the carob honey he makes is the apple of his eye, a creamy treat that recalls the flavor of chocolate toffees. In Italy, carob trees are concentrated in southeast Sicily, and Signor Agosta’s honey is almost an exclusive product, like the honey from spiny prickly pears that prove difficult to harvest. Indeed, he is unable to produce it every year because the flowers are so delicate; but when he is able to make this special honey, it contains the essence of the island in a single, golden drop. Signor Agosta is a solitary man. His solitude, presented to the world in his taciturn speech, is enfolded within the dance of the bees much in the way that Sicilians cloak themselves in natural reticence. It is not easy to navigate this countryside, where the dirt roads form romantic labyrinths that twist between walls of stone. Arriving at his place requires a certain stubbornness, and so that is how we approach it. We had first tasted his devine carob honey at Pozzallo, on the sea. We looked at each other and smiled; it was the honey we had been searching for. We wanted to pay our compliments to its maker in person, and today we share it with you. But please, approach softly. 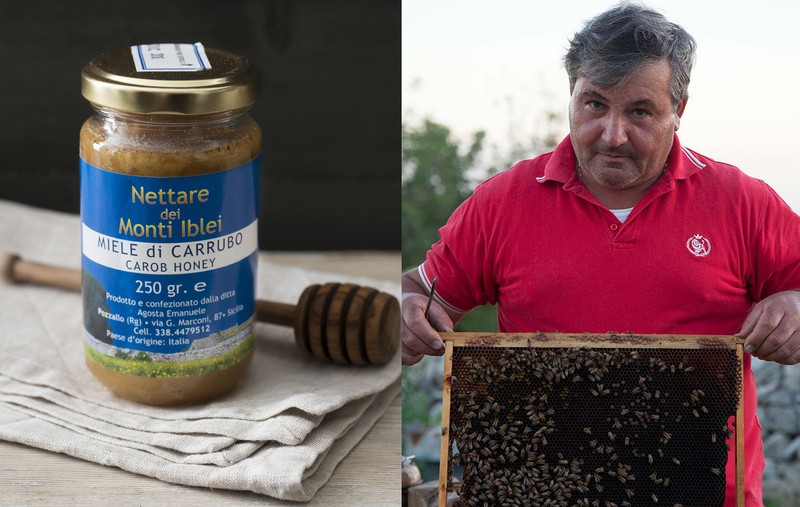 Among the beehives, robust Emanuele might resemble a bear hunting for honey; but the world he occupies is as gentle and delicate as the bees’ own.